PITTSBURGH—A University of Pittsburgh-led team has created a single-electron transistor that provides a building block for new, more powerful computer memories, advanced electronic materials, and the basic components of quantum computers. The researchers report in Nature Nanotechnology that the transistor’s central component—an island only 1.5 nanometers in diameter—operates with the addition of only one or two electrons. That capability would make the transistor important to a range of computational applications, from ultradense memories to quantum processors, powerful devices that promise to solve problems so complex that all of the world’s computers working together for billions of years could not crack them. 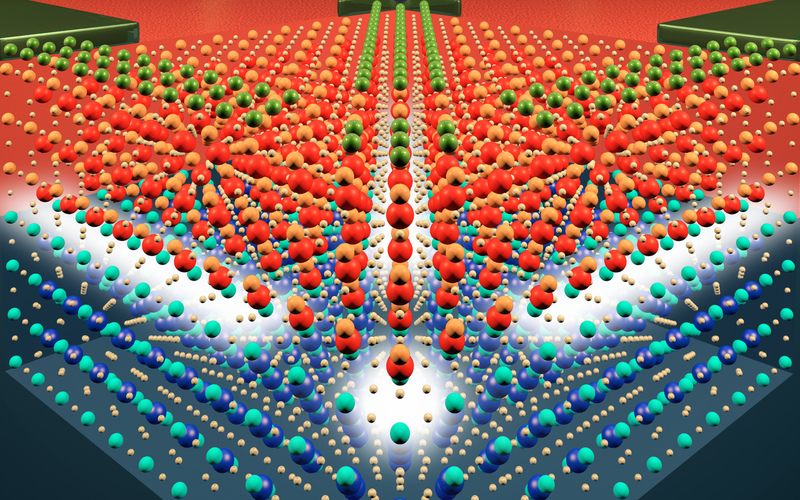 In addition, the tiny central island could be used as an artificial atom for developing new classes of artificial electronic materials, such as exotic superconductors with properties not found in natural materials, explained lead researcher Jeremy Levy, a professor of physics and astronomy in Pitt’s School of Arts and Sciences. Levy worked with lead author and Pitt physics and astronomy graduate student Guanglei Cheng, as well as with Pitt physics and astronomy researchers Feng Bi, Daniela Bogorin, and Cheng Cen. The Pitt researchers worked with a team from the University of Wisconsin at Madison led by materials science and engineering professor Chang-Beom Eom, including research associates Chung Wun Bark, Jae-Wan Park, and Chad Folkman. Also part of the team were Gilberto Medeiros-Ribeiro, of HP Labs, and Pablo F. Siles, a doctoral student at the State University of Campinas in Brazil. Levy and his colleagues named their device SketchSET, or sketch-based single-electron transistor, after a technique developed in Levy’s lab in 2008 that works like a microscopic Etch A SketchTM, the drawing toy that inspired the idea. Using the sharp conducting probe of an atomic force microscope, Levy can create such electronic devices as wires and transistors of nanometer dimensions at the interface of a crystal of strontium titanate and a 1.2 nanometer thick layer of lanthanum aluminate. The electronic devices can then be erased and the interface used anew. The SketchSET—which is the first single-electron transistor made entirely of oxide-based materials—consists of an island formation that can house up to two electrons. The number of electrons on the island—which can be only zero, one, or two—results in distinct conductive properties. Wires extending from the transistor carry additional electrons across the island. One virtue of a single-electron transistor is its extreme sensitivity to an electric charge, Levy explained. Another property of these oxide materials is ferroelectricity, which allows the transistor to act as a solid-state memory. The ferroelectric state can, in the absence of external power, control the number of electrons on the island, which in turn can be used to represent the 1 or 0 state of a memory element. A computer memory based on this property would be able to retain information even when the processor itself is powered down, Levy said. The ferroelectric state also is expected to be sensitive to small pressure changes at nanometer scales, making this device potentially useful as a nanoscale charge and force sensor. Since August 2010, Levy has led a $7.5 million, multi-institutional project to construct a semiconductor with properties similar to SketchSET, he said. Funded by the U.S. Air Force Office of Scientific Research’s Multi-University Research Initiative (MURI) program, the five-year effort is intended to overcome some of the most significant challenges related to the development of quantum information technology. Levy works on that project with researchers from Cornell, Stanford, the University of California at Santa Barbara, the University of Michigan, and UW-Madison. The research in Nature Nanotechnology also was supported in part by grants from the U.S. Defense Advanced Research Projects Agency (DARPA), the U.S. Army Research Office, the National Science Foundation, and the Fine Foundation. An atomic-scale depiction of the SketchSET shows three wires (green bars) converging on the central island (center green area), which can house up to two electrons. Electrons tunnel from one wire to another through the island. Conditions on the third wire can result in distinct conductive properties.